What's the matter is water. Carbon (C), nitrogen (N), oxygen (O) and hydrogen (H) are the most abundant elements with respect to living things. From Physics to Ecology, all scientists interact with these elements to some degree or another (yes, even you, Inorganic Chemists). That being said, these elements are easily found in our everyday lives. Our bodies are filled with them, they are in the food we eat, the air we breathe, and the water we drink. Many of us are well aware that water (H2O), much like sleep, is essential for sustaining life. Humans can survive up to 3 weeks without food (which is mostly carbon), but only 3 days without water. Water is also a necessary component for plants to grow, as you may recall from Claire's last post, contributing substantially to the quality of food we eat. Water is also a particularly fascinating molecule biochemically. In contrast to other elements, it expands when frozen, has an unusually high boiling point, and dissolves a vast variety of substances (thus, water is dubbed the "universal solvent" of all compounds - hence aqueous solutions). That's about as far into depth I'll go before getting to the point of this post. Water is naturally recycled. It can take as short as a day to transfer one evaporated drop into a storm or as long as 50 years, depending on its traveling agenda. Lately, there's been a growing amount of concern about whether or not water is recycling fast enough for human consumption. At 7 billion (and growing) people worldwide, we humans use a lot of water. General schematic of water cycling. While New England is plentiful with water this year, most of the United States - especially the states responsible for most of our food - are experiencing severe drought. This primes the question: Where is all the water used for these crops in big agricultural states - like Nebraska and California - coming from, and why is it "running out"? To answer the first part of the question, check out this interactive map allowing us to see where our water comes from based on our precise location. 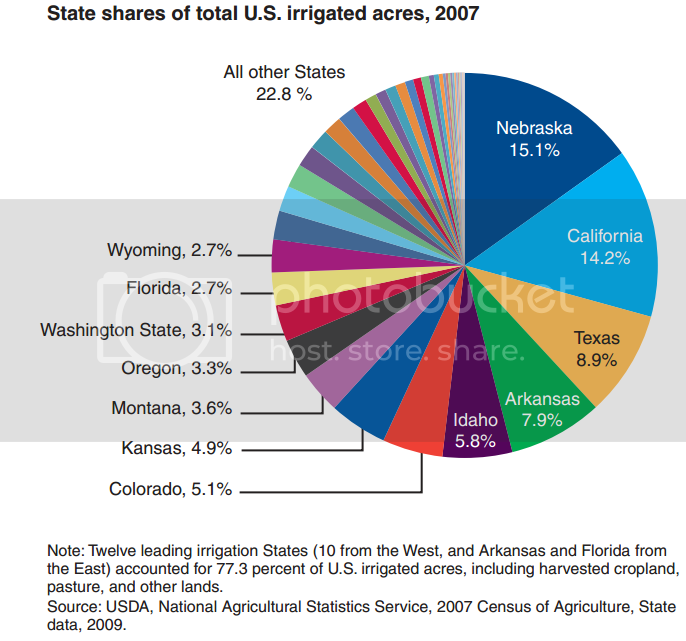 To answer the second part, note that most agricultural hubs and cities in the U.S. are not near large water sources. Bizarre, isn't it? So how do places like Las Vegas exist? Well, they transport water. For MILES. Doesn't make a lot of logical sense, does it? Welcome to politics, dear readers. On top of this, the price of water doesn't match how far it travels or the climate of its location either. I was pretty surprised myself after discovering how astonishingly cheap the water is in my home state (Utah), which is an overall desert climate. No wonder everyone there is always watering the sidewalks with their sprinklers! Water is, therefore, being used in abundance in areas where it doesn't naturally flow, resulting in an overall water "shortage". This is leading to some outlandish solutions such as desalination . . . which I'm sure won't come back to bite us in some form, since mass-scale desalination is totally a part of the natural water cycle, right? . . . There's still a lot that can be done when it comes to salvaging our water. Below are some small scale solutions that won't disrupt the natural flow.